The Foundation is very grateful to its fund holders for their generosity and vision. 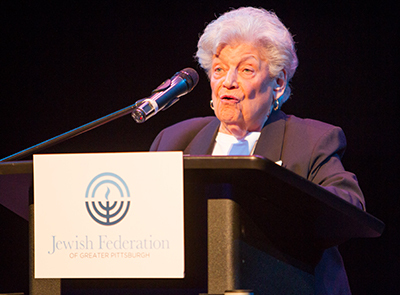 By establishing funds as part of the Foundation, they help assure the strength and vitality of our community, so that we can help meet the most immediate needs of Jews in Pittsburgh, Israel and around the world. Creators of Vision are donors who have responded to the Foundation's special initiative, Creating A Vision: The Campaign to Secure Pittsburgh's Jewish Future by establishing, or declaring their intent to establish, permanent endowments and planned gifts of $100,000 or more. More than 200 Creators of Vision are inscribed in a distinctive display in the Federation foyer. In addition, the Creators of Vision are listed in the Federation Annual Report. Participants in the Lion of Judah Endowment program are women who have ensured that their campaign commitments of at least $5,000 per year will continue in perpetuity through the establishment of a permanent endowment fund of $100,000 or more. LOJE donors are also Creators of Vision, and their names are on the Creators of Vision Wall. LOJE donors proudly wear the Or L'Atid, "light of the future," flame attached to their Lion of Judah pins, which indicates their legacy of commitment to our community. Long-term donors of 32 years or more are welcome to join the Lev Society. "Lev" means "heart" in Hebrew, and these donors -- numbering over 1,400 -- are truly the heart of our community. Lev Society donors are recognized at every major Foundation event for their ongoing commitment to our community.